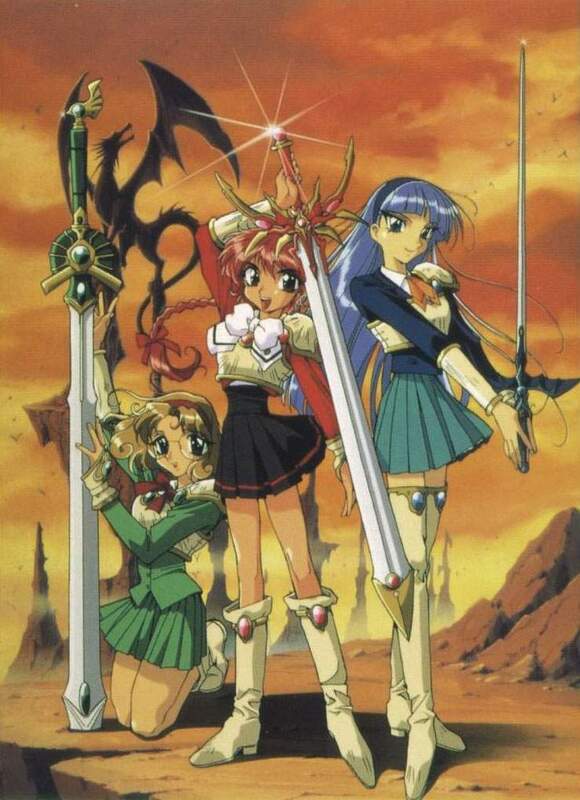 Magic Knight Rayearth is the story of three regular school girls, Hikaru, Umi, and Fuu, whose lives are forever changed at what would be an ordinary school outing. Running out of money at the Tokyo tower telescope, Hikaru is given change by a mysterious young girl, later introduced as Fuu, wearing a neighboring school's uniform. Hikaru rushes to thank the girl, but is stopped by a crowd of students. Trying to pass through, Hikaru glances towards a girl with long blue hair, again from an neighboring school. Suddenly there is a flash of light as they hear the prayer of a young woman calling for help from the legendary "Magic Knights", and the three find themselves suspended in mid-air over the land of Cefiro, filled with mountains and forests. Falling, they land upon a seemingly friendly flying fish. The three young girls are brought to safety on land, still confused as to their whereabouts. However, Hikaru, the smallest of the three, suggests an introduction. Fuu and Umi are at first shocked to find Hikaru the same age as themselves (which is 14 years), for her young appearance is misleading, but their attentions quickly turn to the figure of a rather short man holding a magical staff that had appeared behind them. Introducing himself as Dosh (loosely translated as "master") Clef, a powerful user of magic, he explains that Hikaru, Umi, and Fuu are the legendary Magic Knights, destined to save the world of Cefiro whose captured ruler, Princess Emeraude, is in the posession of the dark priest Zagato. Since the princess had been captured, the land of Cefiro has been plagued by monsters and demons, and will soon deteriorate if Emeraude Hime fails to be returned. Hikaru is the first to respond exclaiming that she is willing to sacrifice in order to become a Magic Knight. Upon hearing Hikaru's eager response Clef raises his staff to give the newly found Magic Knights their magic, but has only time to bless Hikaru as they are attacked by Dosh Clef's now evil apprentice, Alecone. Yelling the incantation "Summon beast!" Clef commands the three to board the magic griffin and escape to the safety of the forest where they will meet Presea, a gifted maker of weapons. Reluctantly the Magic Knights agree to escape as Clef challenges Alecone, in an even battle. Alecone leaves Clef to pursue Hikaru and the others, in hopes of ending the Magic Knights before the legend can be fulfilled. Suddenly, from behind Dosh Clef, the evil priest Zagato appears, and turns the powerful Clef to stone. Aboard the griffin Hikaru senses that something is wrong as she thinks of the sorcerer that had risked his life to help them, but helpless she can only pray for his safety. Alecone appears riding her magical white horse through the air, calling incantations. Determined to survive and save the world of Cefiro Hikaru summons the power within herself and counter-attacks Zagato's minion with a new found strength, becoming the first to find her magic. The Magic Knights are able to escape, thankful for their safety. However, Alecone is not yet defeated. Hikaru, Umi, and Fuu's thoughts turn to finding Presea, maker of weapons. Finding themselves at the opening of a dense forest, the Magic Knights step inside, but the griffin that had transported them there mysteriously disappears in a puff of smoke. At first Hikaru is confused, but after attempting to use her magic "arrow of fire", she realizes along with her new-found friends that magic can not be used in such an forest. Entering further into the woods, they encounter what appears to be the home of Presea. At first they are unable to find an entrance, but then the three girls accidently stumble across it. The Magic Knights are a little hesitant to enter her home uninvited, but proceed inside calling unanswered apologies. Much to their surprise, a cage is dropped over them, as a golden-haired woman appears chanting madly and exclaiming proudly how she had captured Mokana, a white rabbit-like creature with the ability to summon, which has been reeking havoc in her study. Seeing that the ones inside her trap are not Mokana, Presea realizes that Hikaru, Umi, and Fuu are the legendary Magic Knights, as only they would be able to pass through the entrance leading to her home. But before Presea is able to give them the weapons that they have been searching for, a low rumbling noise sounds as a monster appears attacking her study. The Magic Knights run in pursuit of Presea and are led to a darkened room laden with various weapons. Pausing, the three are confused to which weapons to choose, but upon Presea's command they close their eyes, concentrate, and their three destined weapons rise from the rest and go to them. For Fuu, a bow and arrow. For Umi and Hikaru, a pair of swords. The above description came from Anime Generation, and was edited by yours truly (contact me).